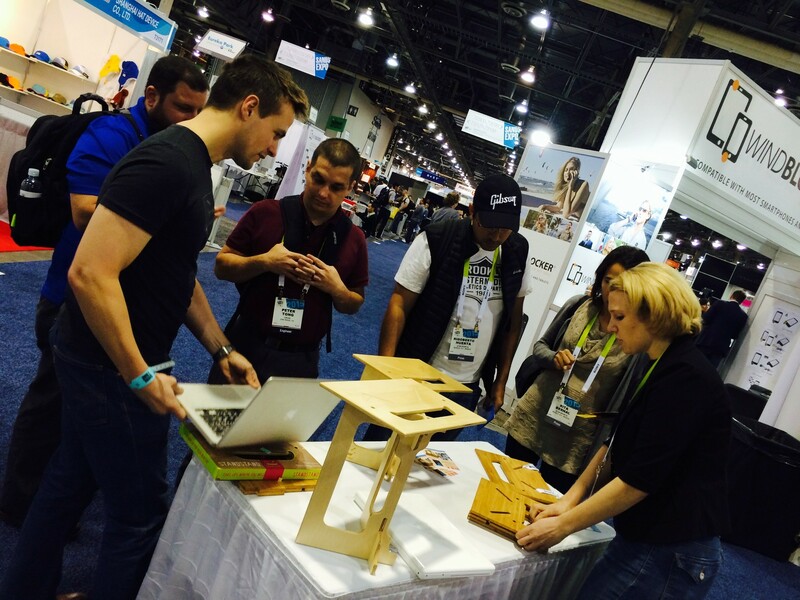 Above: Luke and Lindsay demonstrate how to use StandStand at our CES booth, in all its glory. We soaked in all the options and then just took a big breath and exhaled. We realized that StandStand is a great product on its own, so we didn’t have to flash up our booth. We could just be ourselves and add enough context to the booth to attract people to stop by. Thanks to the guys over at Double Robotics, we got our first inspiration for a truly minimalist booth. Their CES 2013 booth had merely two chairs, a table, a retractable banner, carpet, and their product. Easy peasy! The basics: Carpet, a butcher-block, bistro-style table, a counter stool, and a draped 4-foot-long standard sized table to showcase StandStands… And, of course, lots of StandStands! Colorful banners: A tall, retractable banner and two 4’x2′ vinyl banners — one for the back wall and one for the 4-foot table. Contest supplies: A 8.5″x11″ clear sign stand, one 8.5″x11″ contest rules flyer (inside the sign stand), and 400 small flyers to hand out to booth visitors. Our booth design proved to be exactly what we needed. The 4-foot table comfortably fit up to six StandStands at once, though, we kept it to 3-5 for comfort’s sake. This enabled us to show all three sizes — 9″, 12″, and 14″ — in the front row, while showcasing how to assemble a StandStand in the back row. We also displayed the contest rules on a stack of packaged StandStands to entice booth visitors to enter tweet a picture of themselves with a StandStand and the hashtag #StandStandCES for a chance to win one! We received a couple dozen entries with many more people going home with a picture of themselves with StandStand and a flyer. 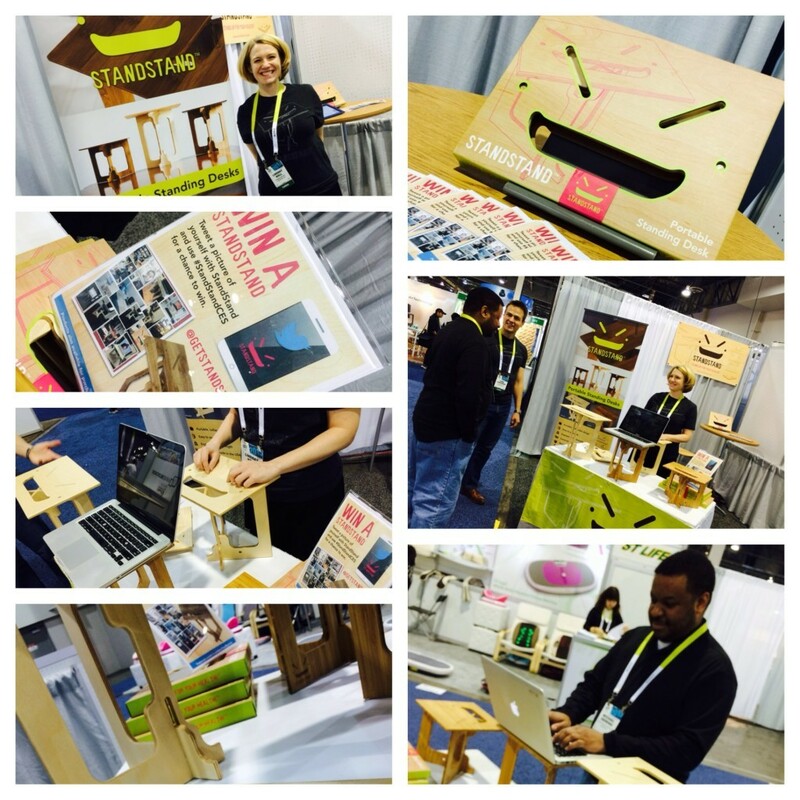 Above: We had a blast with the Twitter contest and enjoyed seeing how people interacted with StandStand. We’re proud that our booth was inexpensive, resourceful, and reusable. All of the displays we used will be used at future events, and the supplied we rented (stool, tables, carpet) are all reusable by Freeman’s, CES’s furniture supplier. We’re especially proud of the retractable and vinyl banners that Lindsay’s cousin, Jordan Noll, designed for the booth. Without them, we would have had a very dismal looking setup! (Great work, man!) These will last for a long time and serve us well, too! Plus, living room decorations?!?! Above: Lindsay shows off our amazing retractable banner, which lists the benefits of using StandStand. What’s not to love? 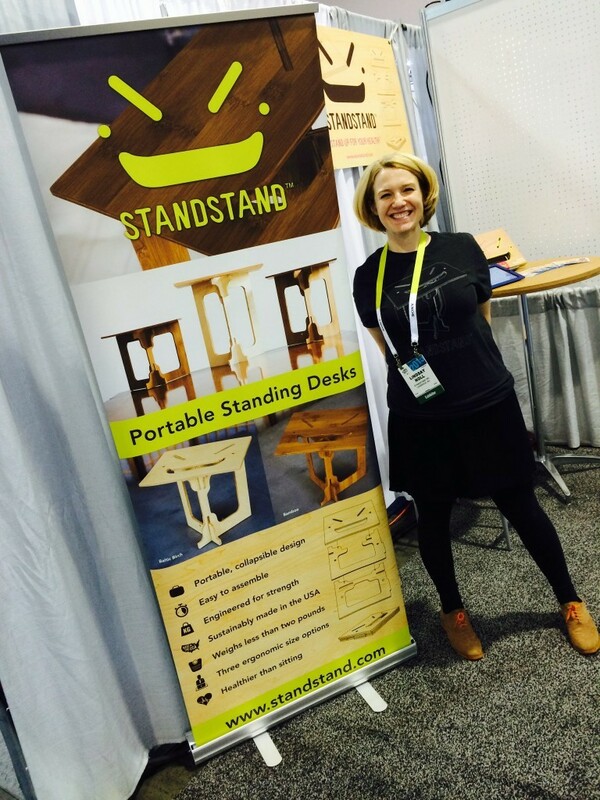 StandStand’s CES adventure was a great start to 2015. We hope yours was just as lovely! 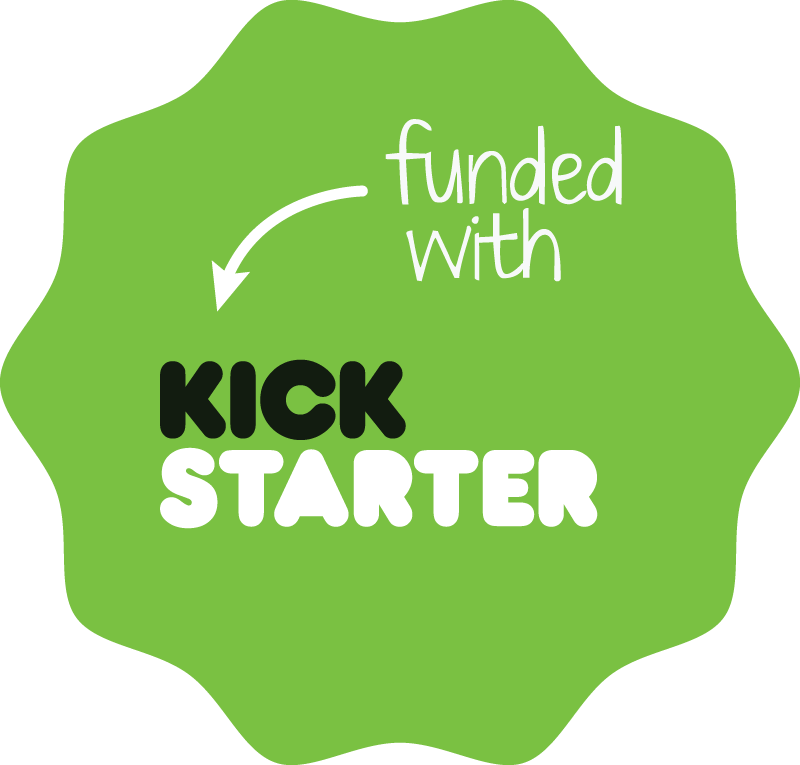 And if you were at CES as a startup or entrepreneur, let us know how you made the most of it in the comments below. We’re anxious to share best practices!